Why I now really like Audible, and why I'm a hypocrite with regards to DRM. For just about one year ago I finally signed up for one of the many offers Audible gives out to get a free audiobook of my choice. 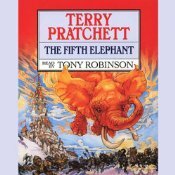 I spent some time making my choice and ended up with The Fifth Elephant by Terry Pratchett, as I am a big fan of his Discworld series of novels. But, when time came to listen to my audiobook, I gave up. Audible locks up their books in a proprietary format. And to download a book, and transfer it to a device for playback, I had to download their equally proprietary software. This software could only transfer audio to devices they explicitly supported. And my device of choice at the time, a Nokia E75 mobile phone, was not supported. Being lazy, I did not bother to try and break the DRM. I simply gave up. I am usually prone to preach anti DRM in any discussion. And I did tell, whoever would care to listen, exactly what I thought of Audible after this experience. Now my device of choice for listening to audio is my HTC Hero. 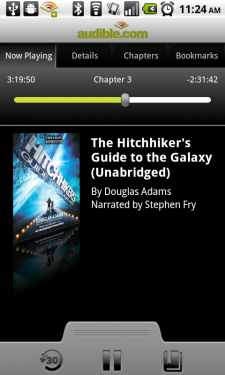 And a couple of weeks ago I became aware of an Audible app for Android. I thought I'd give Audible another go, and maybe even get to listen to my new Discworld book. It's great the same way Spotify on mobile phones is great. I simply entered my credentials, browsed my Audible library, and downloaded my book directly to my phone. No longer the hassle of going through the crappy Windows app. The user experience is equally uplifting. The audible proprietary format enables bookmarking and browsing chapters. And the app remembers where I was. The audio itselft is still locked down behind the atrocity that is DRM. I get to listen, and it's no hassle. My conclusion is that either I'm a big hypocrite when it comes the cause of opposing DRM. Or it just doesn't matter if done right.